Revenue in the Fitness segment amounts to US$16,857m in 2019. Revenue is expected to show an annual growth rate (CAGR 2019-2023) of 5.0%, resulting in a market volume of US$20,499m by 2023. The market's largest segment is Wearables with a market volume of US$14,528m in 2019. In global comparison, most revenue is generated in China (US$5,060m in 2019). The eServices market segment Fitness contains the user and revenue development of two product categories: (1) portable, connected fitness devices (Wearables) and (2) digital fitness and nutrition applications for use with a smartphone and/or tablet (Apps). The Wearables segment includes devices that are explicitly intended for fitness. In particular, fitness wristwear which is equipped with sensors and activity trackers that measure and analyze the physical activity and body functions of the wearer. Smart Clothes and Eyewear are also included. Smartwatches are not considered here as dedicated fitness equipment; therefore they are excluded from the market segment. The Apps segment includes fitness and nutrition apps e.g. calorie counters, nutrition diaries and apps for detecting /tracking/ analyzing and sharing vitality and fitness achievements. Apps that focus on specific diseases (e.g. diabetes apps) are excluded as well as Apps that do not provide any options to directly measure or analyze vitality and fitness achievements (e.g. exercise tutorials or nutrition lexicons). The user base covers paying and non-paying customers. The revenue figures only include revenues generated from paid app downloads, premium/full versions and in-app purchases; eCommerce and advertising revenues are not included. Reading Support Revenue in the Fitness segment amounts to US$16,857m in 2019. 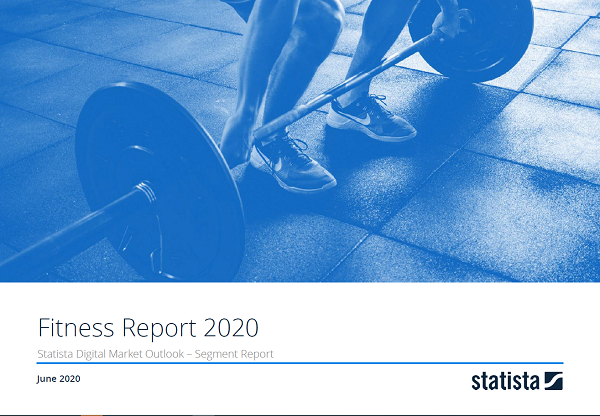 Reading Support The Fitness segment is expected to show a revenue growth of 6.6% in 2020. Reading Support In the Apps segment, the number of users is expected to amount to 972.4m by 2023. Reading Support User penetration in the Fitness segment is at 11.2% in 2019. The “User” box shows the number of active customers (or accounts) of the selected market (market segment, region) in millions for each year. The “Penetration Rate” box shows the share of active customers (or accounts) from the total population of the selected market (market segment, region) for each year. Reading Support The average revenue per user (ARPU) in the Apps segment amounts to US$2.83 in 2019. Reading Support In the year 2017 a share of 36.4% of users is 25-34 years old. Reading Support In the year 2017 a share of 50.4% of users is male. Reading Support In the year 2017 a share of 42.0% of users is in the high income group. Reading Support With a market volume of US$5,060m in 2019, most revenue is generated in China. Reading Support With a rate of 29.1%, the user penetration in the Fitness segment is highest in Sweden. Here you can find more studies and statistics about "Fitness".